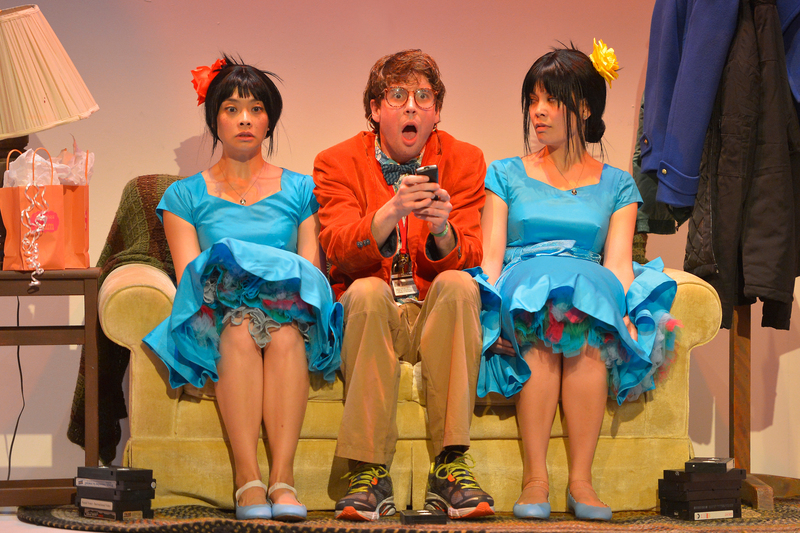 From L to R: Tiffany Villarin as M, Jeremy Kahn as D, and Rinabeth Apostol as L. Photo Credit: Kevin Berne. The pressured adolescent characters in Jiehae Park’s very original short play, “peerless,” have initials (M, L, BF, D) or titles (Dirty Girl, Preppy Girl) for names, live in a generic town (Midwestern suburbia) attend a generic school (High school) and strive to achieve admission to a nameless college (The College). Asian American twins “M” and “L” have devoted their lives to this goal; every daily activity and even their choice of boyfriends is dictated by their ambition. They even arranged to attend different grades in school (one allowed herself to be held back a year) so they wouldn’t compete against one another, but be eligible for admission in different years. Everything seems perfect, until their plans are thwarted when the fat and nerdy “D” (a boy with a crush on “M”) gets the call instead. The twins are stunned, and don’t know what they do, until the mysterious and weird “Dirty Girl” (think of the witches in Macbeth) taunts them with mysterious prophecies and inspires “L” to plan a murder to get “D” out of the way. “peerless” is not the first play to try and spin bloody satirical fun from the story of everybody’s favorite murderous couple (there was the political spoof “McBird,” as well as the film “Scotland, PA,” which set the story in a fast food restaurant). The idea that the pressures of academic success could drive kids mad is, sadly, easy to grasp, in our world of helicopter parents fighting to gain admission for their toddlers to the right preschools, and teen suicide epidemics among the academically gifted children of privilege. Although “peerless” starts to lag in its second half (a serious problem for an intermission play lasting only 85 minutes), its high points are wonderful. As the twins, Rinabeth Apostol and Tiffany Villarin, perform at breakneck speed, finishing one another’s sentences and moving in unison, to create an inhuman effect that is simultaneously funny and horrifying. Each of scenes together is a gem of precise vocal, psychological, and physical choreography. The play features two unforgettable highlights: As L, Rinabeth Apostol performs a lengthy monologue which is simultaneously presented as an interpretive dance; it is a showstopper. Equally good is a monologue by Jeremy Kahn as “D,” the brilliant, nerdy victim of the twins murderous impulses, in which he details his short lifetime as a nerdy fat boy who falls in love and is on the brink of making good. These are two of the best performances I have seen this season, and are not likely to be improved upon. It is a frustrating sort of play: it’s best points are very, very good and its worst are rather dull. One thing is certain: Jiehae Park is a gifted playwright, and we will surely see more and better work in the years to come. “peerless” continues at Marin Theatre Company through April 2nd. For further information click here. “peerless” by Jiehae Park. Produced by Marin Theatre Company. Director: Margot Bordelon. Scenic Designer: Kate Noll. Lighting Designer: Heather Basarab. Costume Designer: Sydney Gallas. Composer & Sound Designer: Palmer Hefferan. Fight Direcdtor: Dave Maier. Stage Manager: Sean McStravick. Dirty Girl: Rosie Hallett. L: Rinabeth Apostol. M: Tiffany Villarin. BF: Cameron Matthews. D: Jeremy Kahn. D’s Brother: Jeremy Kahn. Preppy Girl: Rosie Hallett. Posted in Reviews.Tagged Cameron Matthews, Charles Kruger, Jeremy Kahn, Jiehae Park, Macbeth, Marin Theatre Company, perrless, Rinabeth Apostol, Rosie Hallett, San Francisco bay area theater reviews, theatrestorm, Tiffany Villarin.